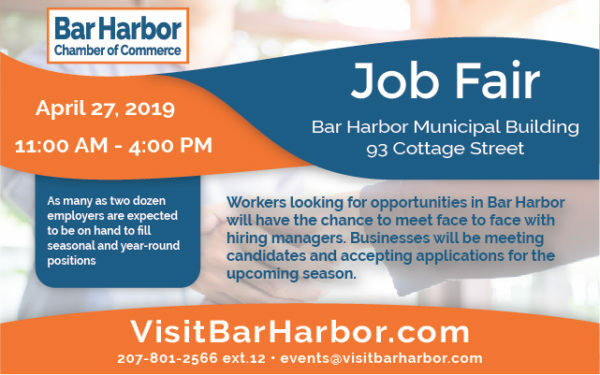 BAR HARBOR — The Bar Harbor Chamber of Commerce will hold its annual job fair from 11 a.m. to 4 p.m. Saturday, April 27, at the Bar Harbor Municipal Building, 93 Cottage Street. Member businesses will be meeting candidates and accepting applications for the upcoming season. As many as two dozen employers are expected to be on hand to fill seasonal and year-round positions. Staffing has been a challenge for local businesses in recent years with more opportunities available than workers to fill them. Job seekers are encouraged to drop in whenever is convenient and to bring copies of their resume or work history and a photo identification to aid in the application process. Space is limited so local businesses who would like to secure a table for the job fair are encouraged to contact the Bar Harbor Chamber office no later than April 19. Registration is free for Chamber member businesses and $30 for non-member businesses.